It could power a fuel-cell car while capturing CO2. Here's the dilemma with hydrogen: fueling your car with the stuff is faster than charging an EV, but making and distributing it is inefficient and polluting. A team from the Georgia Institute of Technology has created a four-stroke "engine" that converts natural gas (methane) into hydrogen from just about anywhere, while capturing the CO2. It could one day hook up to your natural gas line, letting you fuel your car from home in a non-polluting way like you can with an EV -- pleasing both green tech boosters and oil companies. The Georgia Tech team's device is called the CO2/H2 active membrane piston (CHAMP) reactor. Much like with a four-stroke engine, methane and steam are drawn into a cylinder when the piston goes down, as shown in the diagram below. It then rises and compresses the mixture to a temperature of around 400 degrees Celcius (752 F). That causes a catalytic reaction, with no spark or explosion needed, that forms hydrogen gas (H2) and carbon dioxide (CO2). 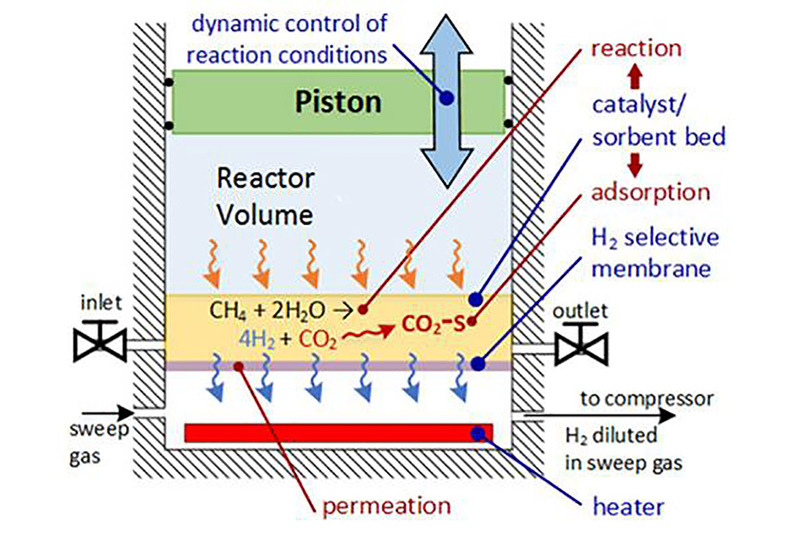 The H2 is absorbed by a membrane and exits the reaction chamber, while the CO2 is "adsorbed" in a so-called sorbent bed, where it combines with a catayst. A further cycle pulls the CO2 gas back into the cylinder and expels it in a concentrated form, where it can more easily be captured and stored. The device uses just two molecules of water for every methane molecule, making it less wasteful than current processes. Furthermore, it operates at relatively low temperatures compared to the 1,800 degree F needed for industrial reforming, so it can be scaled up or down for household or commercial operations. "The reactor is scalable and modular, so you could have one module or a hundred modules depending on how much hydrogen you needed," said Georgia Tech professor Andrei Fedorov. As with much research, it's not perfect yet. Capturing CO2 is one thing, but there's no commercial tech yet for storing it permanently. And the researchers didn't mention how efficient their system is, thermodynamically speaking, at converting methane to hydrogen. Even if were available today, EV tech already beats it in terms of efficiency and pollution. And by the time the CHAMP devices are commercially developed, we'll likely have cheaper, faster-charging and higher-capacity batteries. Nevertheless, hydrogen technology is not going away, because the oil and gas industry really, really needs it to work -- with electric cars renewable energy becoming cheaper and better, we'll soon run out of reasons for oil and gas.